Crafting...: Kate Spain "Joy" quilt ~ finished! Kate Spain "Joy" quilt ~ finished! The Kate Spain "Joy" plus quilt is finished, washed, photographed, and up in the shop! This is just a straight forward plus design, with the addition of lots of negative space. I like that the Christmas fabrics are then not so overwhelming, and the Kona Ash softens it up nicely I think. I added a little strip of pieced binding, just for fun! This quilt finishes at 43" x 56". Very nice! Cute scrappy piece in the binding. I love doing that! Very sweet! Your design makes it not so overwhelmingly Christmassy! I really like the tight quilting lines. Loving the grey sashing too :). The whole thing is great! The ash plusses are a nice contrast! Great finish Heather! The hint of scrappy colour is fantastic! This is such a great Christmas quilt. Love the fabric! I am sooooooooooo in love with this quilt! I love the the Joy fabric and you did an amazing job! It looks great! How do you make your quilting lines so even? Do you use a walking foot and quilting bar? Another great finish! The grey is a wonderful contrast to the Christmas fabric! oh it's very nice indeed! I love the dense straight line quilting! Cute quilt. I love the bulb fabric. Love the Christmas quilt. I bought a little of those fabrics too - just couldn't resist. Love the aprons in your header also. Do you have pattern information for those? 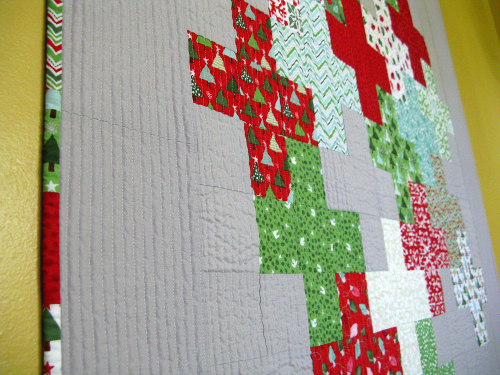 I love the quilt - I have vowed that I will no longer buy Christmas fabric, as it puts me under too much pressure to finish a project. I may have to reconsider this... :) It's lovely! Your quilt is gorgeous!! I love the fabric you chose and the quilting is wonderful!! Lovely quilt. I love the quilting. Beautiful - love the bit of scrappy binding and the dense quilting is fabulous! I love your quilt! Fabulous!! The fabric choice in these are perfect!! I'm in love with that little Xmas light pattern. It's beautiful. I keep thinking I should make myself a holiday quilt, but I haven't yet moved forward with that project. The constant problem of putting things for myself on the back burner! I love it with the grey -- beautiful quilt. I love the bit of scrappy binding. I love it! Wonderful work. 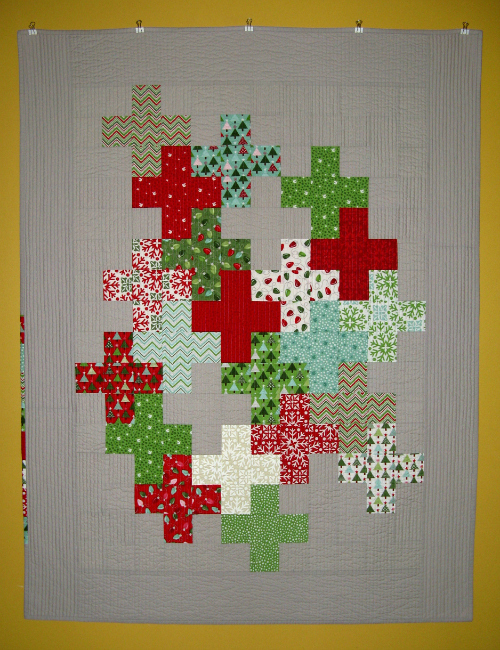 I just started my own (non Christmas) plus quilt, and yours makes me want to make another Christmas version. I just love this design. And Kate Spain is my favorite fabric designer like ever. 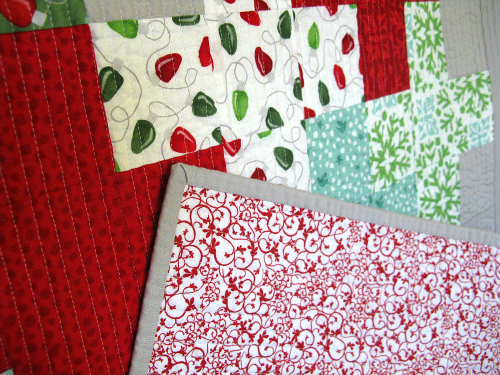 i need to make a christmas quilt or three! love this one tons! very good work! This is so great, Heather! I love the busy prints paired with a neutral ground. Really gives it a modern look! 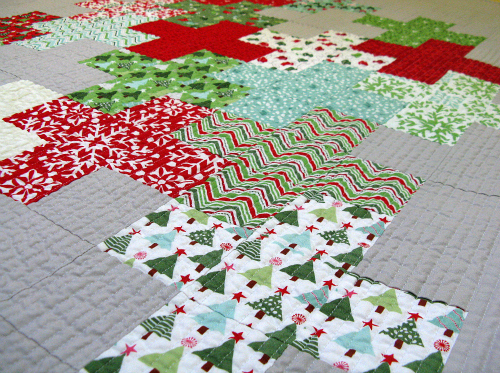 Now I want a Christmas quilt! Love this! What a fun idea to add the piece of binding! Everything about this quilt is so fresh and fun! I love the soothing gray background and the layout. And the patch of scrappy binding is so fun! Great job!! what a great idea. A non christmassy pattern with christmas fabric - wonderful. Can imagine that as a pillow for me. Thanks for sharing.